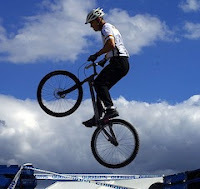 celebrating randomness: bike parkour ?! That sure is the most extreme activity one could do with his bike. I mean, for me bike is something I could use to run short errands at the neighborhood or something I could use whenever I decided to go camping and stroll around the woods this would be the best form of transportation. Well, I guess, you guys just have the guts to do almost anything using your bicycles. Hope you're not hurt or anything.